The Top Yard team at Chatteris. From left are Ballal Javed, Fazaan Khalid, Krisz Horvath, Amaan Nadeem, Majid Romani and Hamad Javed. Peterborough Police Amateur Boxing Club’s first female fighter, 26 year-old Emily Hodges from Wittering, made a stunning debut for the city club last week. She fought Madison Wilson (20) from New Saints ABC in a 57kg contest at a show at RAF Wittering and stopped her in the second round with a powerful performance. The club had four boxers in action at a show in Exhall on Saturday night - all against Exhall ABC lads. Alfie Baker, son of club coach Chris Baker, had his first competitive bout at 10 years-old and showed real class during a comfortable points win against Esher Singh. Muhammad Khan (15) was an unlucky points loser against Keegan Hobson while Imran Khan (17) struggled to find his range against Percy Taylor and lost on points. Ben Hutson (12) looked a class act in a skills bout against Charlie Roberts. At Chatteris on Saturday night, Connor Dane (14) from Newborough boxed Dan Holland from Paramount ABC in a skills bout and looked very sharp. On Sunday, Danny Coupe (16) from Holbeach represented the club at a show in Birmingham and lost on points to Joshua Hamilton from the West Warwicks ABC after suffering a rare off-day. 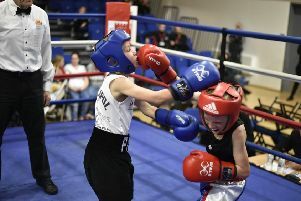 n Fazaan Khalid from the city’s Top Yard School of Boxing made it two wins out of two when he outpointed E.McKenna from Paramount ABC at a show in Chatteris. McKenna was a strong opponent and the bout was evenly poised going into the final round. Fazaan finished strongly, forcing his tiring opponent to take a standing count. Amaan Nadeem showed great heart on his ring debut but was narrowly beaten on points by tricky southpaw M, Beales from Bad Boyz ABC. Krisz Horvath, the club’s 14 year-old super-heavyweight, did well in a skills bout against N.Perkins from Paramount.